Offering you a complete choice of products which include submerged arc welding flux and submerged arc flux. 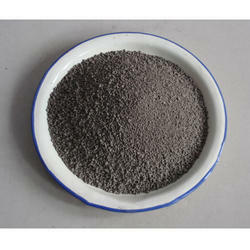 Acid Agglomerated flux for welding carbon manganese steel, low alloy structure and boiler quality steel. This flux is suitable for high-speed welding and provides very good weld bead appearance and excellent slag removal even with narrow groove and fillet welds. The other characteristic of this flux is high resistance to cracking and porosity. Mostly it is applied to double side with single pass weld and fillet welds. As the consumption of flux is very low, it is very economical. Semi Basic Agglomerated flux for welding structural steel. Weld bead hardly increases Si Mn, it belongs to metallurgy neutral. It has perfect welding performance, stable arc, good surface, excellent slag removal, high impact toughness at low temperature. Can be used for many applications ranging from boilers to pressure vessel, pipeline and low alloy steel structure.